Maps are a popular feature in several genres, especially fantasy and historical fiction, making it easier to keep track of characters' relative location and travels among key landmarks. 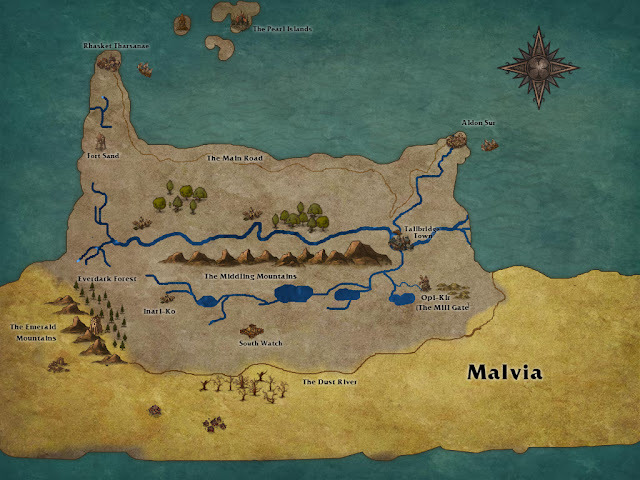 Some of them are true masterpieces, and there are talented cartographers specializing in making fantasy maps, but their services are pricey. I was, therefore, forced to do without maps until recently, when someone pointed me to Inkarnate. The website is still in development so there are some glitches here and there, but overall I'm very happy that I found it. There's a pro plan which is supposed to give you more options, but for now the free plan is enough for me. 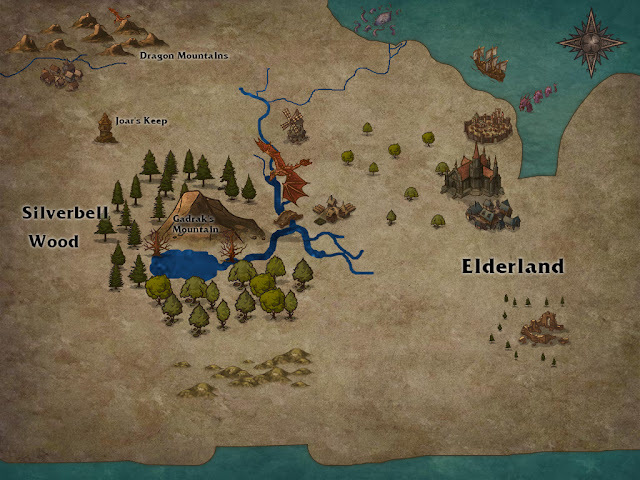 Here's another map, this time of Tilir, my primary setting in the Quest of the Messenger trilogy. I have no doubt I will keep having fun with this tool in days to come! 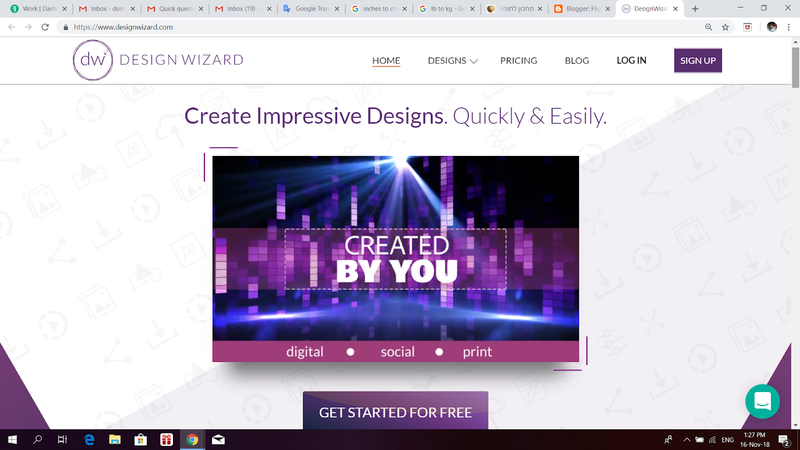 As a follow-up to my post about design resources for authors, today I'm doing a little spotlight on Design Wizard, a new design tool I recently came across. It has many of the same options as Canva, but with a few upgrades. The website is very easy to use for people who are accustomed to Canva and, unlike Canva, it offers image and video editing services. 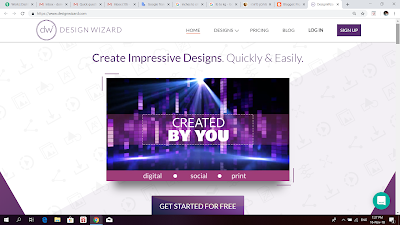 One of Design Wizard's most notable features is the magic resize button that allows you to change the size of an image while you are creating a design, which is pretty cool. If I had to compare the two, I'd probably say that Design Wizard is one rung up the professional ladder, and possibly a better option for people who have a little more budget and a little less time. Now, those who have been reading my blog for any length of time know I'm a real cheapskate, and usually advocate for exhausting all your free options before paying for anything at all. That's mainly because I'm a stay-at-home mom with four kids, so money is a more precious commodity than time. For many of you, the situation may be just the reverse. Bottom line: Canva has a bit more free templates, but Design Wizard has a larger choice of cool fonts, as well as a smoother interface, and could give you stunning graphics with very little investment, so definitely play around with both websites and see which you like best. Also check out DW's blog,which is packed with advice on content marketing, creating visual content and capturing an audience. There are plenty of books, manuals and courses on writing, editing, publishing and book marketing out there. Their authors often swag some pretty nice cash, and have quite a number of happy clients. But you know what? Before you even consider throwing money at writing workshops, books or courses, go and (if you haven't already) read this series of posts by Hugh Howey. Seriously, they are that good. Had the author been any less generous, he could have easily bundled those posts into an e-book and launched it onto Amazon. But as it is, authors at the beginning of their road have a basic, condensed, down-to-earth, no-nonsense guide to becoming a writer without going broke - or getting oneself locked up in a mental hospital. For those who have been living under a rock, Hugh Howey is a mega-successful self-publisher who celebrates never giving away his rights to his intellectual property (i.e. his books). If you are just beginning to query, or have been querying for some time and are thinking of self-publishing, go read what he has to say. I can guarantee that about 90% of your questions will be answered. 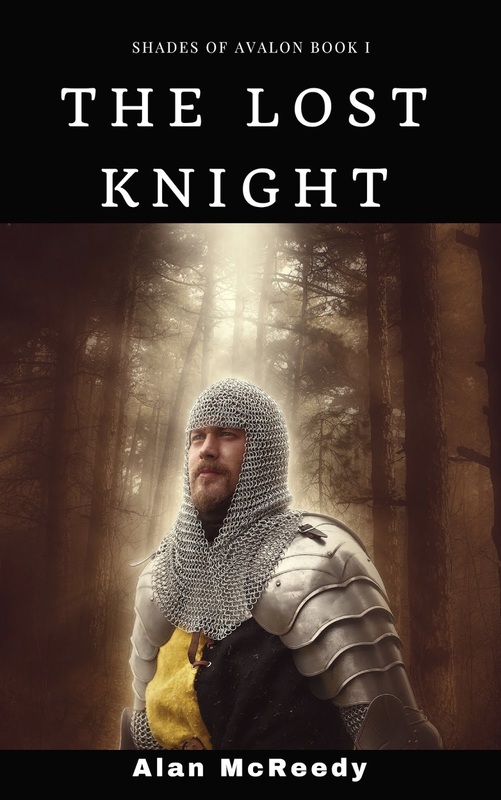 Making one's own book covers is usually anathema in the professional indie book publishing community. It's considered amateurish and cheapskate-y, and you will be warned over and over again not to do it unless you're also a designer. Disclaimer: if you have the budget, by all means don't skimp and invest in a quality cover. It can make or break any book marketing efforts you mean to make. This is especially true if you don't have many titles out and your book is a long-time project you've poured your heart and blood into. However - hear me out - many indie authors make their money not from a couple of books that rock the charts and sell like hot buns, but from a large backlist in which each title provides a steady trickle of income. In that case, a pricey cover for each book is an investment you might never recoup. 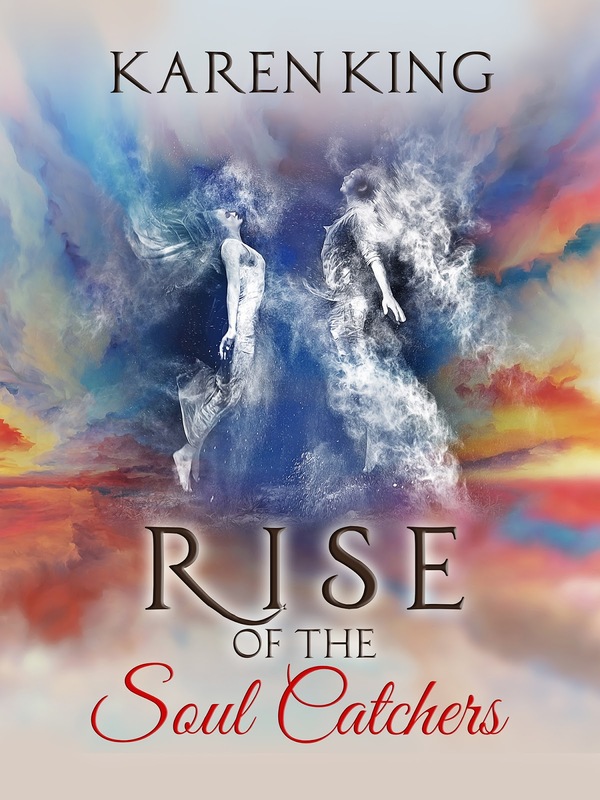 Sometimes you can get lucky and snag a gorgeous inexpensive premade cover. But often, the cheap covers aren't worth paying for at all and, while passable, are no better than a simple cover you can make yourself with very basic skills and without Photoshop. The fact is, design isn't some esoteric ability, it's a skill that can be learned, even if you aren't superbly gifted. In the following simple tutorial, I will show you how to make a basic cover for free, using two very handy, easy tools - Pixabay and Canva. Pixabay is my go-to site for free images; anything you find there, you can use for commercial purposes with no attribution. But, you might be saying, someone else might have used the same image already! Well, yes, that's true. You won't easily find a good stock photo that hasn't been used multiple times. But let's get real - only a fraction of people in the world will read your book, or any individual book, for that matter. The chances of readers stumbling upon both your book and the other book with the same image are not high. And even if it happens, it's unlikely the two titles will be confused. Remember, if there is a problem, you can always change the cover later on. That's the beauty of indie publishing. 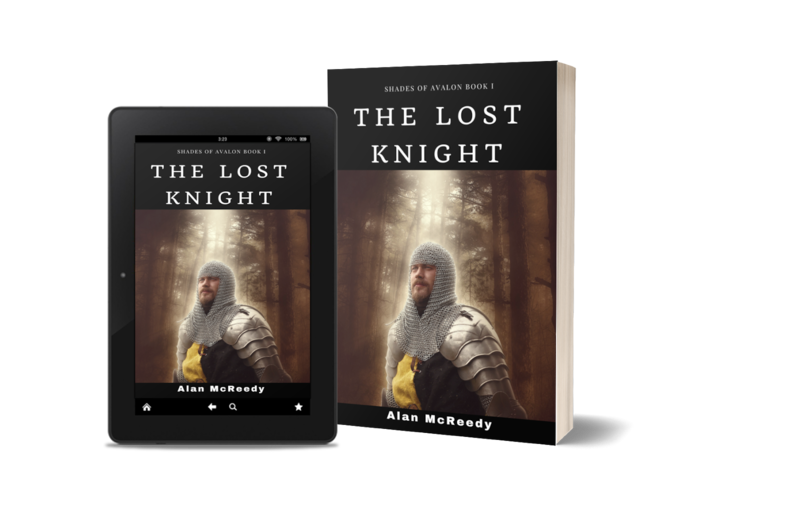 So let's say I'm looking for a cover image for a medieval fantasy/adventure titled The Lost Knight. I search Pixabay for "knight". This image catches my eye; it conveys the genre well, but at the same time doesn't seem to be insanely popular, so I can hope not too many people have used it. The white lettering against black or dark backdrop isn't anything very original, but it does the job. I could play with some special effect options Canva offers, but I decide to pass. I like my image as it is. This simple cover was made in about 5 minutes. I could probably get a much better result if I invested more time in playing with the effects and fonts. 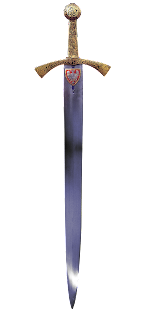 I download my mockup in Png format, which essentially means it has no backdrop and can blend in with any background I choose. I go back to Canva and choose a Facebook banner template. In the Background option, I choose a free image of a scenic mountain backdrop. 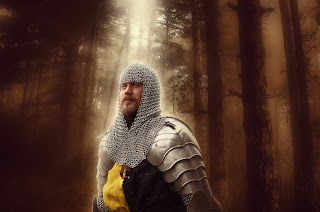 Then I pop on to Pixabay again in the search of some extra element for my banner, something knightly and medieval, also in Png format. 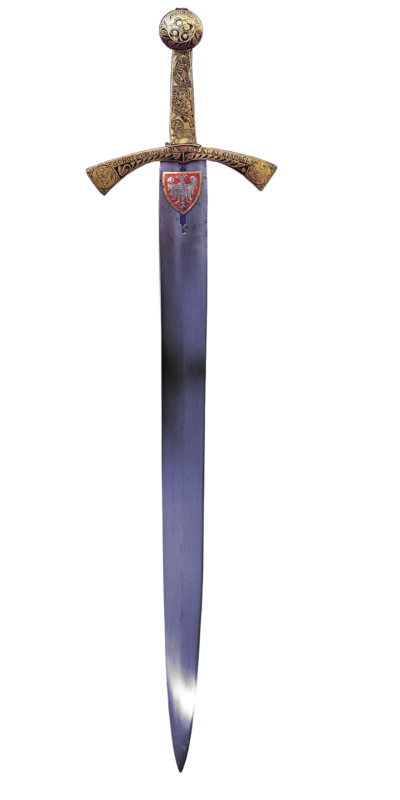 I find this sword: perfect! I could probably do much better with more time and practice, but here I just wanted to show you how easy and fun this is. If you release a lot of books, it is very useful to gain some degree of independence in making your own covers and graphics. So don't be afraid to try it - if you or your beta readers don't like the result, you don't have to use it. Either way, there is nothing to lose. 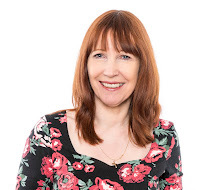 As an avowed eclectic writer, today I am pleased to host Karen King, a fellow multi-genre author and writing coach who goes against the conventional advice of sticking to a single genre and, preferably, sub-genre. So, Karen, please tell us a little about how you first started your career. I’ve been a published writer for over thirty years and whilst nowadays I mainly write romantic novels and Young Adult books, in the early years I wrote solely for children. Most people are fascinated to discover that I started my writing career with the iconic Jackie magazine way back in the early eighties, but it was when I turned to writing for younger children’s magazines that I got my big break and was able to earn a living as a writer. I’ve written comic strips, stories, activities and quizzes for a variety of magazines – Rainbow, My Little Pony, Winnie the Pooh, Rosie & Jim, Barbie, Sindy, Postman Pat – as well as numerous children’s books. I’ve written for all age groups and in a variety of genres; pictures books, story books, activity books, joke books, educational readers, even a folder of 27 plays! I’m often asked how I can turn my hand to writing for so many different genres, and the answer is that no matter what I’m writing my mantra is ‘know your market know your reader.’ I study the market, read other books in the genre I’m writing to get a feel of the characters and story plots that are popular, and I think about my reader. What are they expecting from the story? What age group are they? What are they interested in? This is especially important when writing for children, as the younger the age group the simpler the storyline and vocabulary, but it can also be applied to the different genres when writing for adults. Yes, people of all ages will read YA books, for example, but the average YA reader is thought to be eighteen or under and the average chicklit reader to be early thirties or younger. So this is the readership that the storyline, characters and vocabulary need to be aimed at. If you write a story about the dating pitfalls of a thirty-year-old it’s no good marketing it as a YA, or a wartime romance as a chicklit. My final mantra is ‘Don’t be scared to try something new’. When I sold my article to Jackie magazine all those years ago I’d never have guessed that I’d have 120 children’s books, several short stories, seven romance novels and two YA’s published. You never know what you can do until you try! Karen King writes sassy, fun, heart-warming romance and edgy YA with a heart. Karen has also written several short stories for women’s magazine and had 120 children's books published. She started her writing career writing scripts and articles for Jackie and other teen/children's magazines. When she isn’t writing, Karen likes travelling, watching the ‘soaps’ and reading. Give her a good book and a box of chocolates and she thinks she’s in Heaven. Check out Karen's website, follow her on Facebook and Twitter, and take a look at her books on her Amazon page.